Cold rattles your bones. Snow slicks up sidewalks. Daylight lasts less than you thought possible. All of which means winter’s a perfect time to visit Canada. In warm weather, tourists choke Montreal, Toronto, Ottawa and Quebec City, but frigid temperatures bring bargain hotel rates, easy-to-book restaurants and lower airfares. As if to cheer themselves up, all four cities party all through the season, with terrific festivals and cultural happenings all winter long. So zip up the parka and pack the snow boots; here are some of our favorite things to do in Canada this winter. Looking for a place to stay? From the gleaming new St. Regis Toronto (the first St. Regis in Canada), wintertime Toronto looks like a holiday postcard. Even standard and off-peak dates are a points splurge at this Category 7 property, but you’ll appreciate warming up in the hotel’s infinity-edge saltwater lap pool. When it’s time to eat, remember that soul-warming diner fare gets a local, chef-y twist at the Senator, Toronto’s oldest restaurant. Produce and honey come from the owner’s farm — a jar makes a great souvenir. Meanwhile, Toronto’s Tennessee Tavern feels just as homey, with an Eastern European menu, run by Grant van Gameren, a hometown food star. Order a basket of superb house-made sausages and a Bellwoods beer, brewed nearby. In the coldest season, the Toronto Light Festival casts a warm glow on the historic Distillery District, with mind-blowing light installations from as far away as Lebanon and Australia. Bathe your ears in dulcet tones at Winterfolk, which showcases 150 performers from around the world. Past notables have included Brian Gladstone, D’Arcy Wickham and the Small Glories. Toronto’s also home to one of the world’s largest underground walkway systems, PATH, which snakes through downtown with 1,200 retailers, linking hotels, subways and must-sees like the Hockey Hall of Fame. The InterContinental situates you just north of Old Montreal and just south of the downtown core, with the city’s compact Chinatown just steps away. Nearby Notre-Dame Basilica, which is breathtaking year-round, looks especially magical lit up for the season. Once you’ve settled in, go for dinner at the long-awaited (think: more than four years in the making) Monarque brasserie, which opened in August. The product of Canadian restaurant royalty, this polished space delivers elegant French cuisine. Or warm up old-school at Moishes, a legendary steakhouse where servers plop pickles on your table before famously massive hunks of meat arrive. January’s Igloofest transforms the Old Port into a giant rave, with EDM stars from around the world heating up outdoor dance floors. Too frigid? February’s Art Souterrain showcases 100 world-renowned artists across five miles of Montreal’s underground city, which winds through downtown. 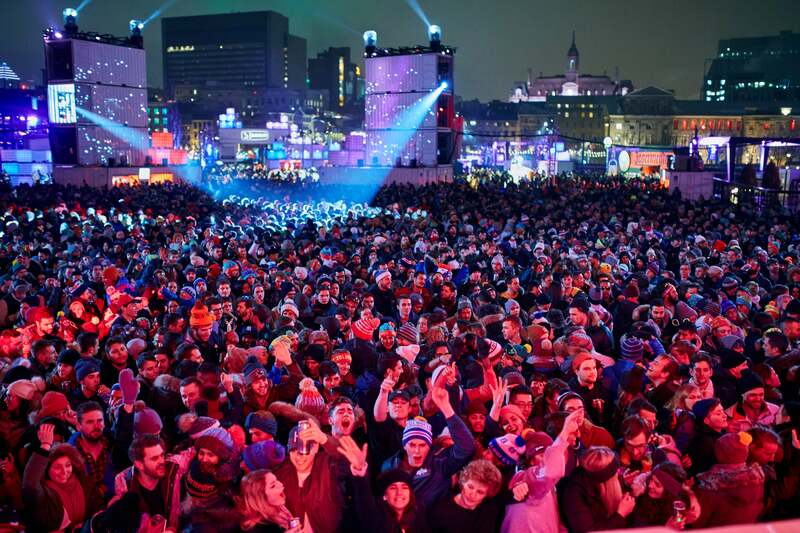 Montreal’s annual Igloofest transforms parts of the city’s Old Port into a giant rave, with guest DJs from around the world. Photo by Jan Charles Prot. The buzzing ByWard Market ‘hood had great food, cool shops and rocking bars long before there were any hotels. That changed when Hyatt’s Andaz came along. Its sleek design and subtle nods to the Great White North is about as high-design as it gets in Canada’s capital, while the property’s Feast + Revel restaurant even draws locals with cheeky takes on Canuck cuisine — smoked elk on “beaver dough,” anyone? Warm your soul with clam chowder made with fish bits and bacon at the Whalesbone, followed by chunky mackerel with pork belly. Handmade pasta is the draw at Supply and Demand in the boho Westboro neighborhood; nettle-and-ricotta gnudi was a recent smash on the menu, which changes daily. Throughout February, Winterlude transforms the capital into a giant gallery/playground, with ice-carving competitions, an ice-borne bed race, and the Rideau Canal Skateway, the world’s largest natural frozen ice-skating rink. Winter’s also a great time to see Canada’s magnificent parliament buildings without summer crowds. We can’t guarantee a Justin Trudeau sighting, but it’s worth a try. 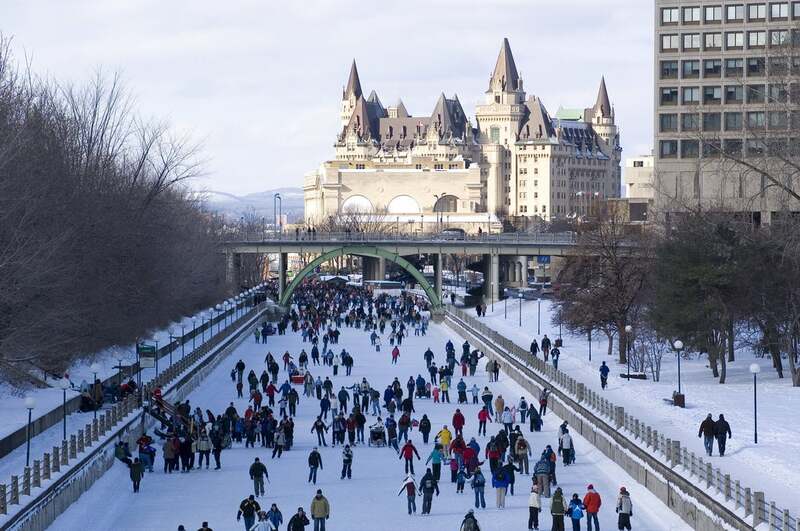 In winter, Ottawa’s Rideau Canal becomes the world’s largest natural frozen ice-skating rink, with magnificent historic buildings as a backdrop. Photo courtesy of Ottawa Tourism. Fairmont’s fairytale Chateau Frontenac reigns as the city’s grande dame of hospitality. In winter, the castle-like hotel looks even more magical, and makes a snug retreat from Quebec City’s brutal season. You’ll also find the Quebec-born Le Germain, with space-age-chalet decor in a century-old building. Quebec flavors shine at Legende, whose kitchen only uses provisions sourced nearby; the daily menu might showcase silky local partridge or earthy marinated mushrooms. Tora-Ya Ramen’s fortifying noodle soups will power you through Quebec City’s potent snowfalls; try the chashu shoyu, with pork and egg. Say bonjour to Bonhomme, the jolly snowman mascot of Quebec City’s legendary Carnaval, a citywide winter carnival that dates back to 1894. Over three weeks, you’ll find larger-than-life parades, snow sculptures, canoe races and even a giant bowling alley. Hosted by the Quebec Aquarium throughout the season, Festi Lumiere uses 500,000 LEDs to create a surreal outdoor circuit that also includes snow tubing, games with inflatables and live music at outdoor fireplaces. 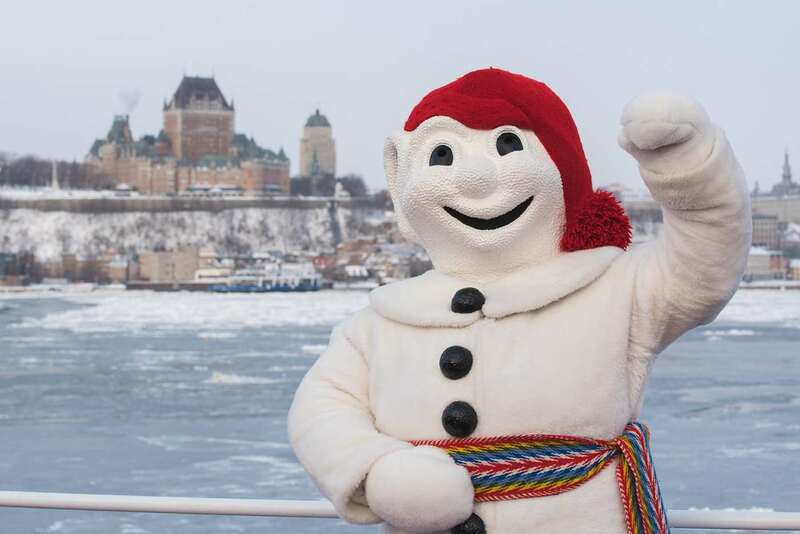 Bonhomme’s the ubiquitous mascot of Carnaval, which has spiced up Quebec City winters since 1894. Photo by Francis Gagnon. What do you like to do in Canada during the winter months? Share with us, below. Featured photo by naibank/Getty Images.